Mark thinks that Luke is a suspicious character. Michael says he'll stay until Christmas then reassess the situation. Pam thinks Brad and Beth have run off. Brad and Beth go into a Registry Office. Beth's mother is ranting and Pam is upset too. Michael says he's looking for a youth hostel to move into on Boxing Day - until he finds something permanent. Cody says she doesn't know why Gaby is bothering with decorations - Brad and Beth didn't want a fuss. Annalise tells Wayne that the wedding can't be too easy on him. He decides to skip the celebrations and go for a drive instead. Annalise and Gaby continue to snipe at each other over the decorations. Lou is tying a bride and groom on to the car when Lauren comes up. Lauren doesn't think she should go to the reception - it would bring back bad memories for Brad and Beth. 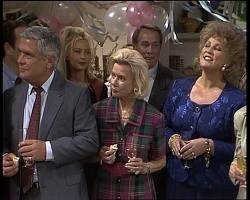 Lou sees Doug, Pam and Beth's mother running off. Cheryl comes up with a bunch of flowers. Lou asks her if she fancies a night out sometime. She says she doesn't think so. Lou asks her how she can refuse a face like his! Pam is grilling Mark for any clues. Doug finds a bus timetable and they run off. Brad and Beth are saying their vows. They are pronounced husband and wife. Brad kisses Beth happily. They sign their wedding certificate. Then they go off to catch the bus(!) Beth tells Brad he'd better ring Pam to tell her the good news. 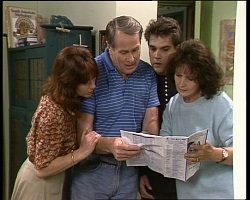 Mark has told Beth that Doug, Pam and her mother are out looking for them. Brad and Beth go off to catch the bus. Annalise has forgotten to buy the champagne so Cheryl sends someone off to buy some. 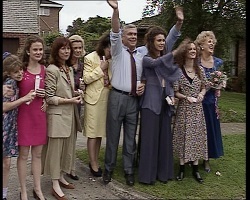 Lou comes round to tell them that he comes bearing bad news - Brad and Beth have eloped. Brad and Beth have got their bus tickets for Perth. 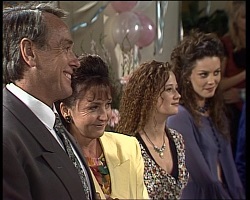 Beth is sad that her wedding isn't an event with her family and friends like she always planned. She thinks they'll be cross for a long time. Brad kisses her and they head off hand-in-hand. Julie is cooking but is short of ingredients. Michael offers to go and get her some more bread from the shop. But Julie sends Hannah instead. Brand and Beth's bus pulls out just as Pam runs up. They are in the wedding car(!) and they tell the driver to give chase. 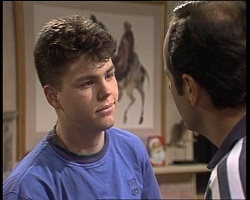 Mark answers the phone to a Lorraine Foster. She says she doesn't have a son called Luke, but she does know him. His real name isn't Foster, and apparently he's bad news. 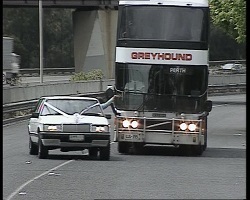 The bus driver sees a wedding car in his side mirror. The car overtakes as Beth and Brad look on. Pam hangs out of the window. PAM: Pull over! PULL OVER! 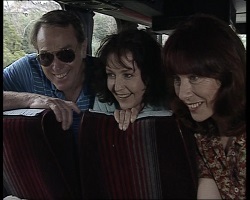 Pam and Doug get on the bus and confront Brad and Beth. They tell them that they'd planned a reception for them, but they'll cancel it, they'll do anything as long as they come home. Beth's mother gets on the bus too and apologises to Beth for her behaviour and says that it's OK if she wants to marry Brad. Beth and Brad decide to go back. They try to tell them that they're already married but they bottle out. They quickly remove their rings. A celebrant is marrying Brad and Beth in the living room. Lou eyes up Cheryl during the ceremony and Annalise and Mark hug. Brad and Beth exchange rings (again) and they kiss as they're pronounced husband and wife. Brad tells Beth quietly that they must be the first people in history to get married twice in one day! Michael doesn't want to go to the wedding reception. Pam cries over how beautiful Beth looks. Mark tells Annalise that he has to go out and do something. He tells Brad that he won't be long. The speeches begin and Brad makes a rather impromptu speech. He tells Beth that she means the world to him and thanks everyone present. Beth's mother says Brad wasn't what she was hoping for for Beth, but that he's kind of grown on her! 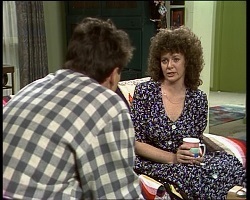 Lorraine Foster tells Mark that she fell for Luke - a boy half her age. He conned her into giving her money to set up a business. Mark says that he thinks he's pulling the same stunt with Annalise - convincing her that he's her half-brother. Lorraine says she'd be pleased to talk to Annalise about it. Michael hangs out alone with Holly the dog. 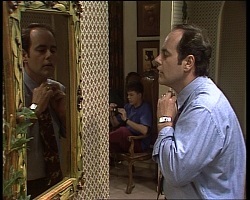 Luke gives Annalise a present of some expensive earrings. She hugs him in gratitude. 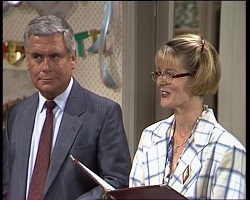 Just then Luke's face falls as Lorraine comes in. He runs out of the back door, but Mark says he won't get far - the police are outside. Lorraine explains about Luke's background and history. He's an imposter. Annalise starts to cry. She said she just wanted to believe that she had a brother - she's always wanted a family to care about her. 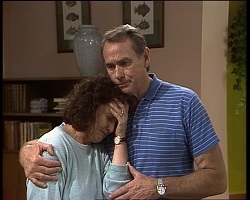 Mark comforts her. Pam hugs both Brad and Beth. 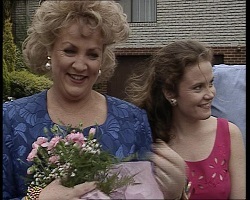 Cheryl gives Beth a bouquet. She throws it and Cheryl catches it. Brad and Beth get into the limo amid confetti throwing and drive off. The sign on the backs reads, "Just Married At Last!"